Our first full day on the island kept us busy with snorkeling and travel-planning. 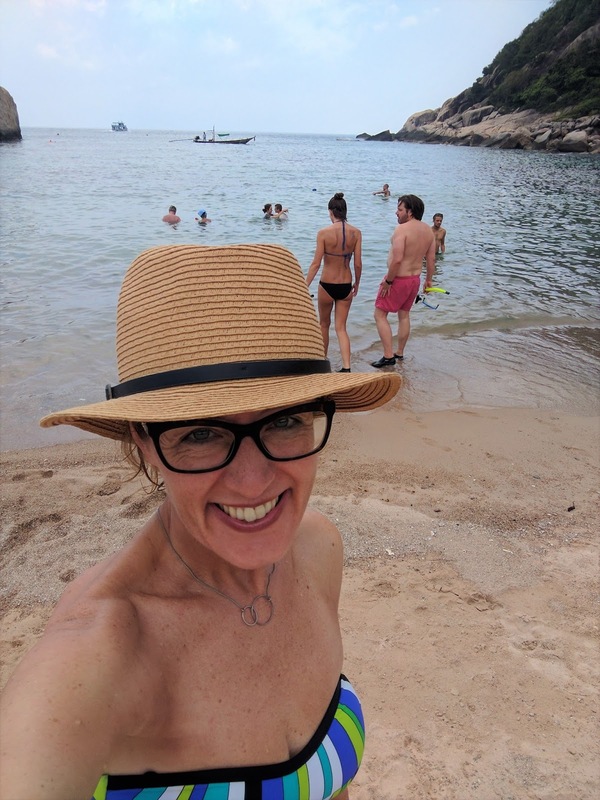 Scott's co-worker/replacement Jacqui was spot on with her advice - the snorkeling right off of the beach immediately in front of our hotel is amazing! We rented snorkels and masks from a hotel just down the beach from us for 50 Thai Baht - the going rate, and just $1.50 per person - and off we went. We started seeing fish as we were still wading out! 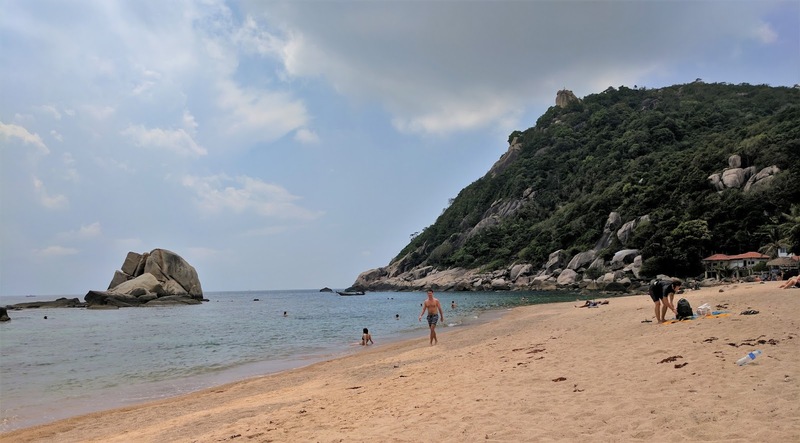 The water is so salty that floating and swimming without fins is a breeze, and we swam out to a large rock formation in the middle of our small beach, Tanote Beach. There were lots of coral and rock formations on the otherwise sandy ocean bottom where the fish feed and frolic in great numbers. There were so many varieties of fish in all the colors of the rainbow from yellow and orange to silvery-blue and shades of blue and pink iridescent, the same kind that we saw snorkeling at Ang Thong Marine Park a few days ago. The fish were beautiful, but it was the spectacular marine-scape that blew us both away. The coral and rock formations, in bright lavender, emerald green, deep purple.... and huge "brains" of coral, with furry neon purple "lips" of giant clams wedged into various crevices. We've had some incredible snorkeling sessions in Tahiti, Hawaii, and the Caribbean, but never anything quite like this! Between snorkeling sessions, we grappled with the very spotty wifi connection at the hotel in an attempt to plan our next steps. 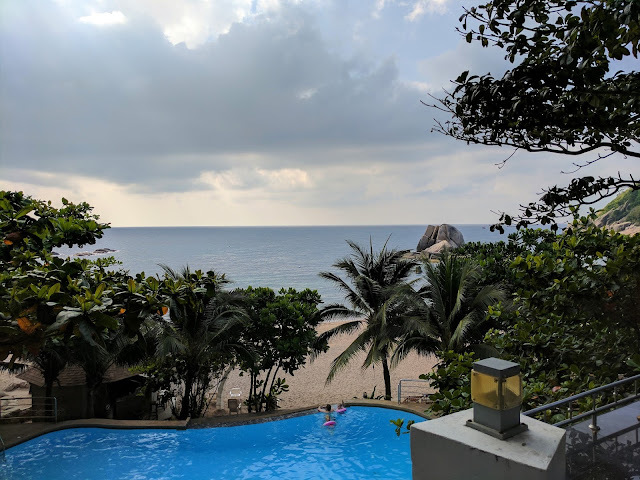 We booked a hotel for 2 nights at Railay Beach in the Andaman Sea, to see the supposedly picturesque coastal cliffs there, popular with rock climbers. Thus far, we have been in the Gulf of Thailand, so we're interested to see what it's like on the west side of the Thai peninsula. From there, we are planning to continue on to Ko Lanta and/or Ko Phi Phi and/or Phuket - decisions, decisions, decisions - before we head up north toward Chiang Mai, where we intend to plant ourselves for a few weeks. Stay tuned!